Aside from the three new colourways of the low-cut edition of the Jordan Sky High Retro, Jordan Brand is set to give their followers a treat this summer with the release of a rare make-up of this casual shoe. 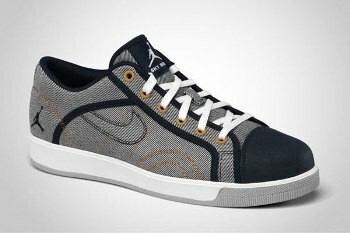 Tagged as the Jordan Sky High Retro TXT Low, this casual sneaker will be available in Obsidian/Metallic Bronze-Wolf Grey colourway that will feature an “inverted denim” look accented with Bronze lining along with white midsole and wolf grey outsole. With the release of this edition of the Jordan Sky High Retro Low, you’ll have four choice and we can guarantee that all of them will give you your money’s worth.